After decades of social progress towards equality, women are still under-represented in Science, Technology, Engineering, and Mathematics (STEM), particularly at advanced career stages and in leadership roles. Disparities are perpetuated in part by gender bias, which often occurs on an unconscious level due to the influence of our cultural environment. Further, the retention rates of women in STEM continue to be negatively impacted by the scarcity of female mentors and role models. By breaking barriers to the success of underrepresented groups in STEM, we can increase diversity and in turn innovation and discovery by STEM problem-solvers and leaders to benefit our global society. 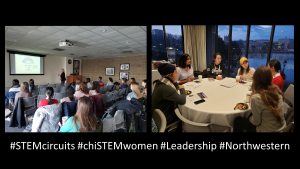 Hence, our mission is to build an inclusive self-sustaining community composed of Chicago-area students, postdoctoral scholars, and professionals to support gender equity and the success of women in STEM. Fill the mentoring gap for early-career women in STEM at Northwestern by establishing “STEM Circuits”. Host a high-impact International Women’s Day (IWD) event on the Chicago campus of Northwestern to raise community awareness of implicit bias, a critical obstacle to STEM diversity. Stay tuned for more information about upcoming events.